What’s the story: In 1976 four anti-Israel terrorists hijack an Air France plane. Over seven days they hold the hostages at Uganda’s Entebbe airport, under the eye of tyrant Idi Amin. The Israeli government debates whether to take offensive action. What’s the verdict: Director José Padilha helmed the Brazilian drug cartel movie Elite Squad and its impressive sequel. He oversees the similarly hard-hitting series Narcos (for sake of argument we’ll ignore that ill-advised 2014 RoboCop remake). Padilha directs with the immediacy he brought to the documentary Bus 174, his searing debut and a true Film You Must See Before You Die. Little surprise then to see him on directorial duties for Entebbe. An account of the real life 1976 hijacking of an Air France flight by two Palestinian and two German terrorists, its mix of executive level and street level operations is comfortably in Padilha’s wheelhouse. What is surprising is his decision to intercut key moments of the film with a conceptual dance piece. Seemingly a commentary on Jewish annihilation and resistance, it’s a bold move and just about works. Although subsequent viewings could see that opinion flit back and forth. 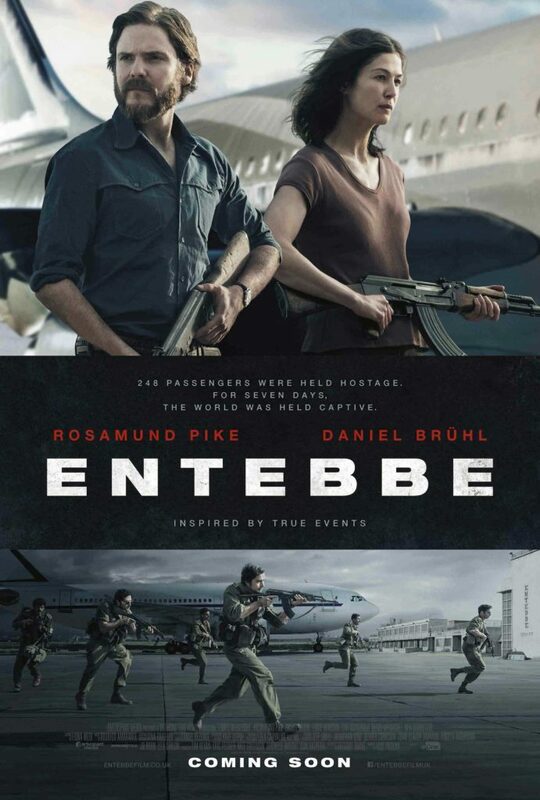 Entebbe (aka 7 Days in Entebbe) is on firmer ground with its recreation of the hijacking, the nightmarish week in the dilapidated airport and the Israeli government’s internal battles over a best course of action. Three 1970s films about the rescue attempt swiftly followed the actual events. But, Padilha and ’71 screenwriter Burke have the benefit of released files that revealed government reactions to the crisis. And, presumably Israel’s efforts to get unpredictable Ugandan despot Idi Amin (Anozie) to assist in freeing the hostages. Pro-intervention is hawkish Minister of Defense Shimon Peres, played with cool menace by an unblinking Eddie Marsan. Big Bad Wolves’ Lior Ashkenazi is perfect as Prime Minister Yitzhak Rabin, torn between Israel’s no-negotiation policy and the need to bring the hostages home safe. Padilha and Burke succeed in injecting genuine tension into the scenes of politicians arguing in beige offices. The hijacking itself and the scenes in the oppressively hot airport carry a same urgency. The two Palestinian hijackers, seeking release for 53 “political prisoners” and a $5m ransom, are brushstroke characters given little time to make a mark. Greater interest is afforded Brigitte Kuhlmann and Wilfried Böse, two Baader-Meinhof terrorists and played by the film’s front and centre stars Pike (flint-eyed chilling) and Brühl. Flashbacks fill in their motivation and Padilha and Burke attempt a sober, balanced view of all sides. The Palestinians have seen loved ones killed, the Nazi connotations of killing Jews sits ill with the leftist Böse. Even if the film does comes down on the side of those not hijacking planes. The excellent Denis Ménochet’s flight engineer acts a voice of reason, suggesting to Böse that building things may be preferable to blowing them up. Where Entebbe stumbles is in its depiction of the hostages. Little more than faceless victims, better may have been to sacrifice that conceptual dance piece in favour of increased scenes of them coping with the ordeal. Particularly as the story justification for the performance (an Israeli Defense Force soldier’s fractious relationship with his dancer girlfriend) is thin gruel compared to a moment where the Air France captain tells his crew they cannot abandon the Israeli’s being held at gunpoint. The raid itself is a swift, tense operation, made more nerve wracking because of the haste in which we see it thrown together. Entebbe is not the final word on the 1976 hijacking. But, it is a timely effort to depict an event at risk of being forgotten.